I am hated with Gadgetzan because I am working on the Insane title. I can't even complete this quest chain. LOL. Otherwise great guide for what I was able to do! You said Garadar was in Nagrand, not Outland, but still a great guide! 10/10! It is not cross realm shareable. Really disappointing after having someone stay with you for 5 hours camping and waiting for the quest for you to finish. Managed to get this after about 10 minutes of trying. I messed up a lot on a lot of the newer zone names, but they sink in pretty fast. Just spawned at 11:38am server time on Hyjal. Non-druids probably only have Uldum portal from Org/SW as their best option. Caverns of Time or Theramore teleports would be second place choices. Druids have a dream portal to Feralas in their order hall. Rogues who have been lucky in their order hall may have looted the permanent scroll item that gives them the teleport to Ravenholt Manor. Mages should have their Ancient Dalaran teleport. Anyone who did Mists challenge modes and got silver (was it silver? I forget) times were given permanent teleport spells to the challenge mode dungeons. Scholomance is one of these and pretty close too. (Also handy for getting to the Greench). This is a bit further away than the above options, but druids have another dream portal to The Hinterlands. Do you have none of the above? Then you'll have to fly from Undercity or Ironforge. I forgot about my dream portals when I did this on my druid. I also received in the mail from Johnny Awesome after completing this quest. no need partial shorting to earn achievement. select simple shorting, write down zone names and locations, learn, earn achievement. easy. As a warrior, you can use Timeless Stratagem to Heroic Leap without failing the quest or dropping the quest item from A Huge Package. I have the problem with speed of which the envelopes are being renamed so i can deliver them. Any ideas on how to speed this up? Blizz likes to tease me... he knows that I didn't get Invincible yet... and they make me deliver it to SOMEBODY ELSE? I hate mouse games. Why can't the sorting game use keys? I look back upon our adventures together as if they happened yesterday. Several of my admirers informed me that you looked rather... sullen... when last we met. While I see no reason for such behavior when you had the pleasure of working with the world-renowned Johnny Awesome, I did feel a twang of... what was it... pity? Being as such, I felt it appropriate to send you this tip as a token of my appreciation for your efforts. Do people still tip? If people do NOT still tip, please return all attachments to me at once, along with a small amount of coin to cover my shipping costs. He also included a Timeworn Heirloom Armor Casing as a tip. I am in the 2nd stage of trying to find the post office and the thing isn't showing for me. I have reclogged and everything...So maybe blizz moved it? -Took me awhile to find the entrance to the post office. Only clue in guide was that it was accessible by the pet cemetery. I was looking for a door, when I should have been looking for the 'mail tube'. Here is a snapshot of it. -After completing 'Due Reward', you'll get another mail, which asks that you come back to the post office. The "Mail Tube" (the entrance to the post office), is located at /way 33.24 31.78 . After playing more rounds than I care to remember, I've not seen any locations that aren't on this list for about an hour now. This is by no means a definitive list but I will check back for comments and update any new locations found. Seriously one person can loot this every two hours? Brilliant Blizzard. That would be fine on a low pop server, but on a high pop one? I waited between 14.00 and 16.00 hrs today on the EU Emerald Dream server watching the spot non-stop and nothing dropped. As an aside, a player called Iornshard who already had the Postmaster title stood there and continuously spammed the mailbox opening and closing the post scroll for TWO HOURS. Every now and then he would use path of ice as well, which meant he was active, and aggressively spamming the post box on purpose. While he was there the item never dropped. I am still waiting 15 minutes over the two hours and still, nothing. I am wondering if there is some way to stop the item from dropping by spamming the post box? Other people mentioned his behavior while they waited, too. Just thought I would let others know about it in case it happens elsewhere. Will it stay up, even completing it afterwards? .... even if I didn't get the pet and title? So basically what I'm saying will the "tube" be at the spot? Do you still get an heirloom upgrade after an hour or so? Does anyone know if this can be done on multiple characters? Actually, you get the toy, Katy's Stampwhistle, when you complete The Total Package Achievement, along with the stones and the letter to pay-it-forward. So Past Haste gives just the pet, it seems, and Priority Mail gives just the title. Personally, having only started playing 4 months ago, I do not feel like studying geography like I am back in school is worth the pet, but I made lists on sticky notes and stuck them on the tubes (on my screen) to help me get the 15 in a minute needed for The Total Package and the toy. Worked fine. Took about 6 tries. I almost got discouraged because i knew 30 in a minute was too much for me, so that's why I wanted to clarify.. if you are after the toy like me, don't fret, you only need to get 15. Something that helped me a lot was paying particular attention to the words that make up the names of places and making themes that associate with an expansion such as; Anything that had something in the name that was associated with beer, Asia or bugs was obviously Pandaria. It's just a little thing but when i was stressing and struggling to remember where half the places were, it helped me settle and read things clearer. I also did have and use the weak aura to help me fill in any i had not heard of before or ones i just plain forgot, but usually by the time i had read through and found what i didn't know i'd already lost four or five seconds putting me behind. It's only something small but hope it helps. I rearranged VomitComet's list to sort them alphabetically by zone, instead of only alphabetical. I find that it helps me associate where the zone is a bit better than having them mixed up. It especially helps with all those freaking horde/alliance themed ones like Lions/Valiance/Deliverance/Honor and Thrallmar/Warsong/Conquest locations. Copy it into Wordpad and use tabs to get the spacing right and print it landscape. I have a problem with the notes not getting an address on them for the first thirty seconds or so... i was wondering if anyone else has this problem. I was able to do the 15 min a minute but the 30 in a minute is impossible without them loading right away. It makes it EXTREMELY frustrating. Any help would be appreciated. I even disabled all addons thinking that was the issue yet it is not. Please HELP! Set up quick flashcards, crammed for 20 minutes, got the pet. First of all you need to find That can be find next to Mailbox in Dalaran ( of any of them ) I was flying from mailbox to mailbox and i found it - this way you startking quest chain for Postmaster :) ( see on My video how is look that letter. 4 Use portal kill 3 mobs and travel to Feralas. 6 Fly to Hillsbrad Foothills and go to The Sludge Fields. I got this achievement by making a TinyCards deck to learn the locations. It's here if anyone else wants it. This allows you press Numpad 1 then it will move the mouse to the Kalimdor Bag and click it Numpad 2 is eastern kingdoms and so on. You might have to change the coordinates for the Click function depending on your resolution. I was using 1900x1080. In order to start the script you have to right click it and press run as administrator. You MUST run it as admin or it will not work with WoW. After all of that is done and the script is running, start the game. As soon as a location is on the screen use your macro that pauses the game and when you know the correct bag use the corresponding hot key but make sure you use the hotkey while the game is paused, because that's where the beauty of this comes in. If you use your hotkey while the game is paused it will click the correct bag and move on to the next location in less than a second. You can changed the pause time or you can click the macro again while it is paused to double the time. Then you pause again as soon as a new location is on the screen and rinse and repeat. I was able to get 45 in 60 seconds very easily thanks to this. Good luck all. For those still trying this and having issues getting it done with the weak auras help like i did, you can use the following macro to pause the game so you have time to read and make the right guess. this pauses it for 10 seconds every time you press the button. I changed it to 5 and still did well over 30 for the achievement. Make sure that when you're in the postmaster room that you don't have Warmode on (Or be ready to fight other players), because the room isn't technically a part of Dalaran so you can get attacked. And if you die, you can't get back in and have to resurrect at the spirit healer. Very annoyed by this as there's not even an indication that the zone is a PvP area. The quest stopped after completed "Service with a Smile". Received "Urgent!" in mailbox from The Postmaster. But the entrance to Postmaster in Dalaran disappeared. Big thank you to Sevlr for posting a visual list to which city belongs where. Putting this image below my wow screen didn't help me when I was scrambling during the challenge, but it helped me figure out which city was in which region. In the end, I had to memorize a handful of cities and come up with tricks to remember ones that I was constantly forgetting and getting wrong. Here are some random ways I memorized some of the locations. Lor'danel and Lorlathil both start with L and sound elvish. They also bookend the tubes as one goes in the tube all the way on the left and one goes in the tube all the way on the right. 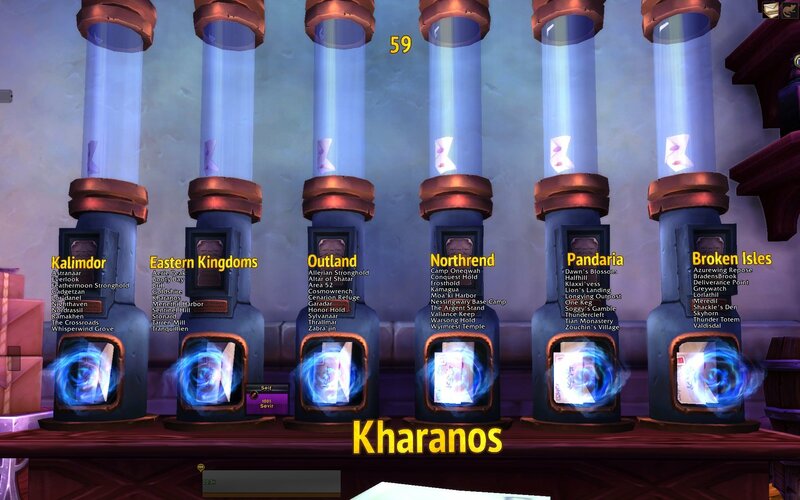 Lor'danel starts with Lord so I said to myself "Lord have mercy on the left" and put it in the mail tube on the left. Lorlathil for whatever reason reminds me of Lorelai from Gilmore Girls. So whenever I think of her I pushed her clear on the right. Klaxxi'vess - looks like a bug name. Thundercleft - Clefthoofs are these big brown animals in Nagrand. So when you see 'cleft' think animal and put with pandas. Tian Monastery - surely you've seen pandas with their monk hats and all the panda dungeons in monasteries. So all the cities that have a "ooh-a" or "oh-a" sound go to Northrend. Like KamagUA or MOA'ki Harbor. I was always getting Allerian Stronghold and Altar of Shatar wrong. But both start with "Al" and both belong to Outland. When you've practiced enough that you're around the 20-25 mark and you're still getting a handful wrong all the time, play wow in windowed mode and open the memo app (free program that comes installed in Windows) and make the memo app width as long as your window. Then write down the ones you get wrong in the memo pad. I put tab spaces between the cities so that they would be under the mail tube they belonged in. As long as you only have 1~2 cities on your cheat sheet, you should be able to quickly glance below to see where that tricky city goes.